Discipline. It is something every trader wishes to improve, heck, maybe it even made it on the ‘New Year’s Resolutions for Trading’ list. 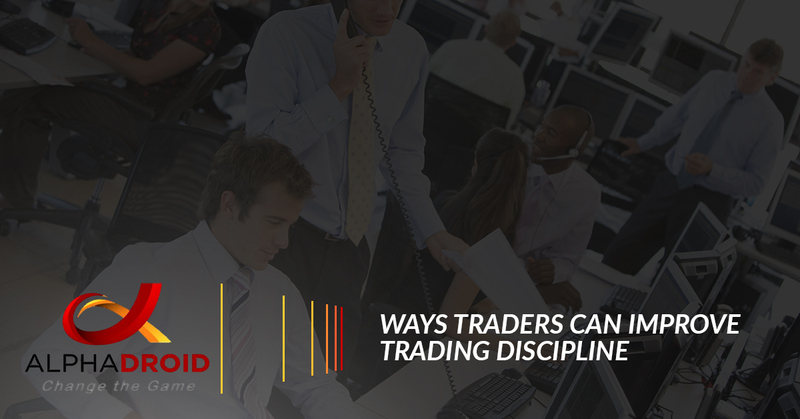 Undoubtedly, discipline is one of the most essential trait traders need to increase their chances of success. A lack of discipline is one of the leading cause of trading mistakes — such as making impulsive decisions, violating risk management rules, or executing trades prematurely —and often are the reason why traders earn below-average returns. Developing discipline is no easy feat and many traders struggle with it at one point or another. Trading discipline can come in differing forms, some even experienced traders are unaware of. In this article, we will explore what discipline in trading really looks like and share some simple ways traders can become more disciplined in trading. You know you should exercise instead of watching another episode of the same TV series you have already seen multiple times if your goal is to lose weight. You know that you should stay home and go to bed instead of going out with friends during the middle of the work week. Of course, you know what to do, but are you actually doing it? A detailed trading plan is essential. Traders use these plans to plan their trades ahead of time. Before they begin trading, they should take time to analyze their trading instruments, mapping out potential trade opportunities. A thorough plan will make common mistakes like entering trades prematurely or impulsive trading less likely. Upon entering the market, these plans are used to execute trades. A carefully planned out, detailed trading plan will help traders become more disciplined. Having a trading plan in front of you will make you more likely to stick to it. Similar to a detailed trading plan, a checklist that is made up of trading rules is a great tool that traders can utilize. These checklists should include any necessary entry criteria. Before entering each trade, traders can use this checklist to things off, compare information, and stay organized. Using a checklist makes it easier for traders to determine whether certain trades are in line with their criteria. Begin able to visually see that the trade they are considering is within violation of their rules will make trades less likely to make trading mistakes. Many traders do not believe they have the time to record their trades. In fact, most traders will not even look at their trades again after they are closed. Typically, once a trade is closed, trades will move onto the next opportunity. However, keeping a record of trades can be very beneficial for traders. It allows traders to look back and revisit their past trades, see what was done wrong, and how they developed overtime. Additionally, it will make them more likely to avoid trading mistakes, especially repeat mistakes, during their trading sessions. There are many benefits of utilizing algorithmic trading strategies by using an investment portfolio management software. Not only do automatic trading strategies minimize emotional investing, ensure consistent and diversified trading, and is less time consuming, but it can significantly improve discipline, helping increase returns while mitigating risk. Because the trade rules are established and trade execution is performed automatically, trading discipline is protected, even in volatile markets conditions. Automated trading helps make sure that discipline is maintained because of the trading plan. Not all of the above ways may seem applicable to every trading system. However, discipline is not limited to trade entries and it encompasses a few different levels. Let’s review some of the areas where traders often lack discipline. Of course, a more disciplined approach to risk management can have benefits for just about any trader. Knowing how much risk there is can help traders limit losses and avoid trades that will lead to a profit-loss. Every trader experiences losses. However, it is the disciplined way that traders handle losses that can make or break their session. Traders that don’t let their losses get out of hand and have a plan on how to execute stop-loss orders will have more success in trading. When it comes to profit taking, there are two issues at hand. First, traders often close trades prematurely and often miss out on potential profits. And second, traders often become greedy and want to create more profits by not closing winning trades, eventually losing their profits. Establishing a disciplined approach to profit taking can help traders be more successful. Trading discipline is important when it comes to entries. Enter a trade at the wrong time, and it is possible to be hit with a profit loss. 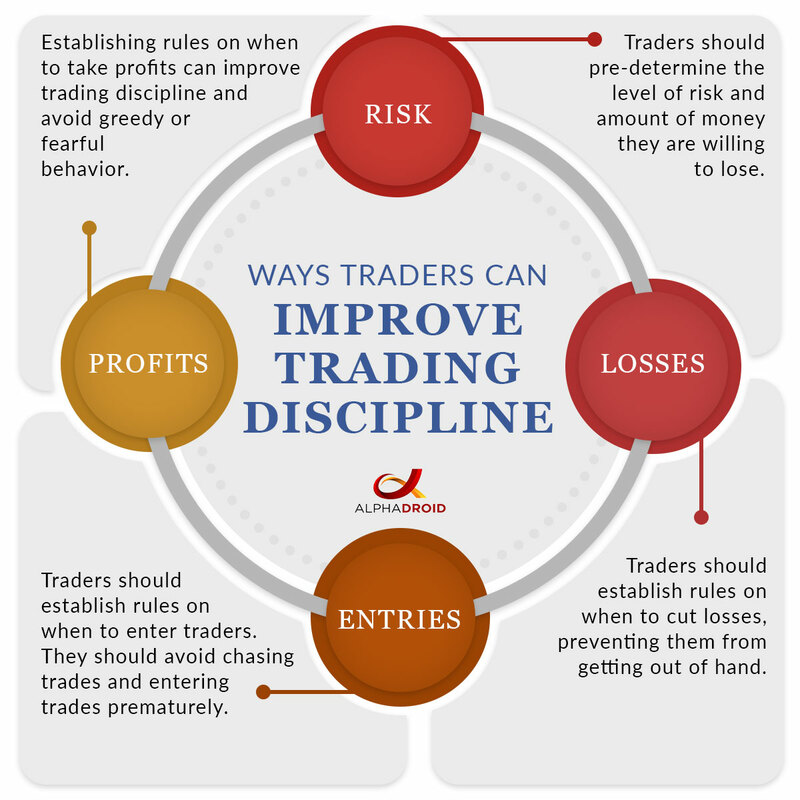 To be more disciplined when it comes to entries, traders should establish rules and criteria for entering trades. Additionally, it is important to avoid entering trades prematurely and chasing trades. Of course, improving trading discipline is not something that is done overnight. It takes a lot of time, focus, and, well, discipline. However, by following the tips above and being mindful of the different aspects of trading discipline, traders can establish a more meticulous approach to trading. If you want to start improving your trading discipline, there is no better way to start than by automating your trading strategies. With AlphaDroid utilizing automated trading strategies is more effective than ever. With this financial trading tool, traders can better analyze, construct, and compare investment portfolios. If you are interested in learning more about AlphaDroid, contact our trading experts today, or begin your 30-day Free Trial.